Square Arch at Cedar Breaks National Monument. Image courtesy National Park Service/Rob Whitmore. Summer - Cedar Breaks National Monument is often 10-30 degrees cooler than the other surrounding Utah parks. Plan accordingly. And because of the high altitude and thinner air, use a higher sunblock than you'd normally use; sunburn is a significant problem in climates and areas like Cedar Breaks. Winter - The main thing to know about Cedar Breaks to tell you about winter weather is that the main road, Highway 148, through the park is closed from mid-November until mid-April and used as a snowmobile trail and winter sports trail. Cold, snowy, and if visiting during the winter, or any season for that matter, please check the local weather forecast before you go, bring plenty of water and other supplies, and pay attention to your surroundings. 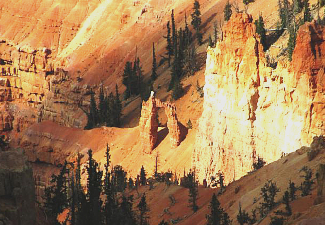 Photo above: Cedar Breaks Lodge, no longer there, but important to other lodges in national parks. See story below for that very reason. Right: View of the sky over Red Rocks at Cedar Breaks National Monument. Source: National Park Service/Rob Whitmore. 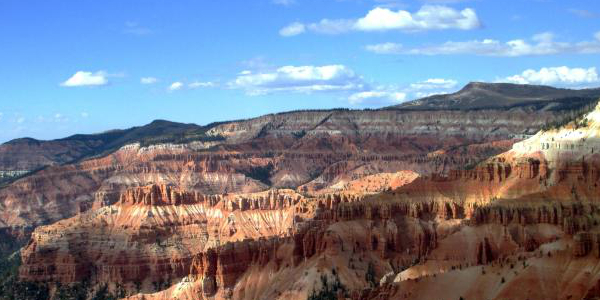 Of the Utah parks of nature and wonder, Cedar Breaks is that small gem. Not far from the spectacular and well attended beauty of Zion and Bryce Canyon, this smaller cousin provides a unique glimpse into the red rock canyon architecture that nature built, as well as an amazing spot to ply your winter sports days. Yes, at Cedar Breaks, they turn the main tour road into a snowmobile trail for six months. In summer, there's ranger tours and campground experiences, trails to hike and overlooks to marvel at that architecture cobbled together thousands and thousands of years ago. Treasure it. Watch the world go by from a high elevation or hike down through its depths, if you're able and willing. While Cedar Breaks certainly is not attended like those other parks, you won't be alone. People are starting to discover this gem on their Utah national parks treks. And they, and you, should, too. Cedar Breaks Lodge. 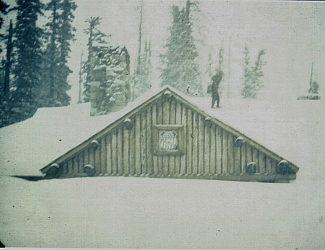 The small lodge pictured at the top of the page was built even before the park became a national monument by the Utah Parks Company of the Union Pacific Railroad in 1924. It provided hospitality to guests at the national park for decades, until 1970, used as a lure for visitors to use the railroad and visit. The service was provided by many other lodges built by the railroad as well with the Utah Parks Company providing a tour of the Grand Canyon, Zion, Bryce Canyon, and Cedar Breaks. In 1972, the Cedar Breaks Lodge, the smallest of the lodges, was torn down. An uproar arose, enough to save the other lodges. This park is not new, signed into existence by Franklin D. Roosevelt by presidential proclamation as a national monument on August 22, 1933 to preserve the special rocks, canyons, and heritage of the Southern Paiute of Cedar Breaks. 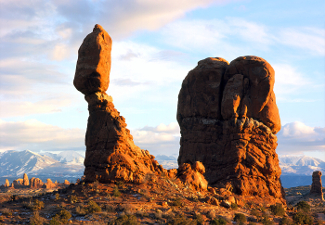 Along the way, the Utah Parks Company, even before the park designation, would bring tourists here. And Roosevelt's Civilian Conservation Corps would come to build the Visitor Center and other structures. Of course, that's just talking about recent visitors. The Desert Archaic people have been coming for nine thousand years. Europeans since 1868. And the nature that abounds in the rocks and valleys longer than all. Even the trees have history. Some bristlecone pines are said to be 1,600 years old. 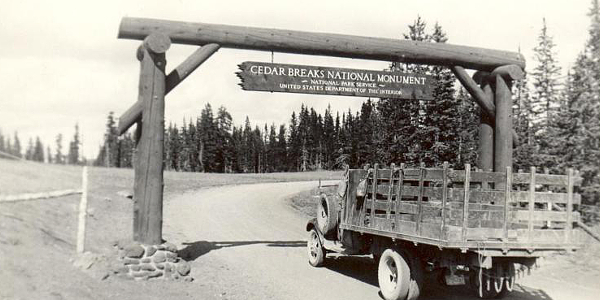 Photo above: Early entrance sign at Cedar Breaks National Monument. Imagine the ride in that truck. Can we say bumpy? Photo courtesy National Park Service. Below: One of the canyon overlooks in winter. Courtesy National Park Service. 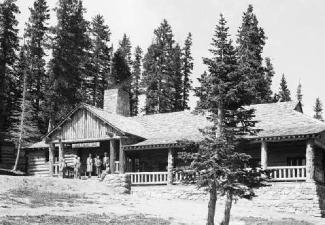 Today, there is no lodge, but there is the historic Visitor Center on the canyon ridge that was built in 1937 by the Civilian Conservation Corps, plus a campground nearby and all that nature to witness and explore. The Visitor Center is on the National Register of Historic Places and been used for that purpose since its construction. Some quick questions about Cedar Breaks. How large is the amphitheatre? It's approximately three miles wide and two thousand feet deep. Is it still eroding? Yes, but you won't be able to see it during your visit. Pace of erosion, two inches every five years. How much snow falls here? Two hundred and forty-five inches a year. If you come in the summer months, there are festivals on Wildflowers and the new Plein Air Art Festival. Cedar Breaks National Monument T-Shirts and Souvenirs from the official merchandise of America's Best History. Great for your next western vacation or planning session. 1. Head to the Point Supreme Overlook for a ranger talk or walk from mid-June to mid-September. There's usually three talks and one walk per day. Learn about the geology and history of the area from those that really know their stuff. 2. For those winter hardy folks who love to snowmobile or cross country ski, take advantage of the trails on the five mile auto tour that's transformed into a winter sports track for you each season. For miles you can travel down the snowy path of Utah Highway 148. And all along the way, you'll be in proximity to that large Cedar Breaks canyon to your west. 3. Stare into a sky so dark and marvel at the stars. There are Star Parties in the campground amphitheatre on Saturday nights during the high season. If you're there then, don't miss it. Photo above: The brilliant colors of the Breaks at Cedar Breaks National Monument. Courtesy National Park Service. Visitor Center - In the historic CCC building, it's open from mid-May to mid-October. There are exhibits, ranger orientation, talks and tour schedules, restrooms, and a bookstore. A winter ranger station is open on weekends one mile south of the UT-143 and UT-148 junction. It's in a yurt built in 2007. Go here if you're in for winter sports fun and need orientation. Not always staffed or open. Auto Tour - Drive the monument from north to south or south to north. Highway 148 and later Highway 143 are five miles long through Cedar Breaks. The overlooks and scenery from them is amazing. Point Supreme Overlook is 10,350 feet. Sunset View Overook 10,354 feet. Chessman Ridge Overlook 10,467 feet. North View Overlook 10,435. Yes, they're all high and located on the east side of the monument. Hiking - A variety of trails spur off Highway 148, both in length and skill level. On the easier side of the equation, the Campground Trial runs from the campground to the Visitor Center for one mile. The Alpine Loop Trail is two miles long through forest and meadow. Spectra Point and Ramparts Overlook Trail is strenuous, along the canyon rim at 10,500 feet in elevation, and four miles long. Rattlesnack Creek Trail is rugged, ten miles long, and drops up to 3,500 feet. Only experienced hikers should try that. Lots to see on all these trails. Hike to your capability and bring plenty of water and supplies. Photo above: Cedar Breaks Valley. Photo courtesy National Park Service. 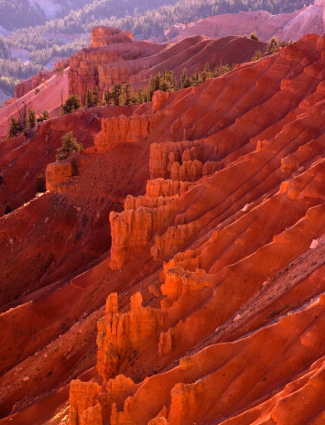 Cedar Breaks National Monument is north of Zion and west of Bryce Canyon and not far from either. From Zion, Springdale, it's 79 miles. Take UT-9 east for 23 miles, north on US89 for 23 miles, west of UT-14 for 23 miles, right on UT-148 for four miles. From Bryce Canyon, it's 60 miles. West on UT-12 for 14 miles, North on US89 for 7 miles, West on UT-143 for 32 miles. Check your GPS or favorite map program for the best route from your specific location. 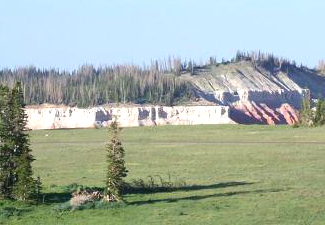 There are no restaurants or lodging currently within Cedar Breaks National Monument. The closest locations for those services is in Brian Head Town, Duck Creek Village, and Cedar City. Check out your favorite online lodging site such as Expedia for the lodging type of your choice. There is one developed campground near the Visitor Center. Point Supreme campground has twenty-five sites, some are reservable, and it's high, at 10,000 feet elevation. There is potable water and restrooms available during the season, which is usually mid-June to mid-September. An amphitheatre in the campground hosts evening ranger programs on weekends in July and August. Star parties are also held some nights. Additional camping can be found in the adjacent Dixie National Forest. 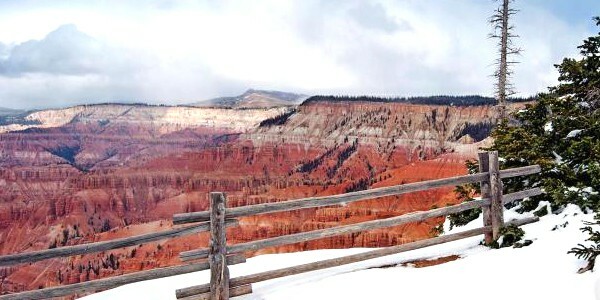 Photo above: The old Cedar Breaks Lodge in winter. Well, at least the roof with man atop. Courtesy National Park Service. Every year, Cedar Breaks holds a festival of wildflowers with twice daily walks from the Visitor Center plus family activities about the blooms around the park. Held mid-summer. Check with the visitor center for this year's dates and times. 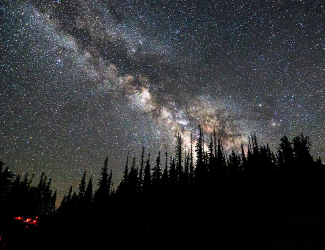 Photo above: The Milky Way from Cedar Breaks National Monument. Courtesy National Park Service/Zach Schieri.